Only make changes if you know exactly what you are doing. Often incorrect changes can have an impact on the application viewing the database and leaving the app non-functional. 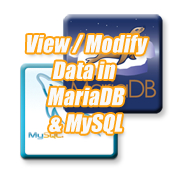 Within control panel select MariaDB / MySQL database, on the bottom of that screen is a link for phpMyAdmin, select that. This will open a new window for phpMyAdmin. Within the left frame you can select the database you want to modify.